Exercise ball routines in 30 minutes! With all the hype of core and functional training exercise ball routines have become very popular in the last few years. How do you determine which routine is best for you? I know of one Pilates Ball Video in particular that encompasses a variety of moves that works the whole core of the body, as well as the upper and lower extremities. Here is a sample of what you'll find in my 30 minute Pilates Core Ball Video. Get your Pilates ball video by clicking here! This Pilates-based exercise ball routine that incorporates flexing, extending, twisting, and side bending to keep your spine strong and flexible. It also has a variety of positions lying, sitting, side bending, and on your stomach utilizing all angles of the ball and your body to work the arms and legs as well. From a sitting position you will warm-up the spine by flexing, extending, rolling, and twisting. You will stretch your legs and warm-up the feet and ankles. From a lying position you will strengthen the core or abdominal muscles helping with balance and body awareness. In this exercise ball workout you will do Pilates exercises such as the bridge or hip lift with the added challenge of using the ball. From a side lying position on the ball you will work the waist and oblique muscles. Stretching yourself into a longer leaner you. Incorporating Pilates exercise ball side kicks from this angle will really work the hips and thighs to tone and lengthen them. From a stomach on the ball position you will work to increase your core strength and balance along with upper body strength doing stability ball pushup, jackknife, and opposite arm and leg balance. This is one of the best exercise ball routines that has it all! "The results working with the Pilates Core Ball really are amazing! The resistance and unstableness of the ball works on better alignment, isolation of muscles, torso strength, and training the deep abdominal muscles. This is something I recommend to everyone." 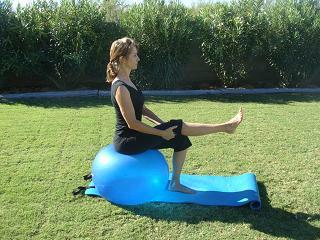 "Through my Pilates Core Ball Workouts I have better posture and balance. Exercising on the ball works all my muscles simultaneously and has improved my flexibility. I also notice increased energy and endurance to do my day to day activities." "Pilates, especially the exercise ball routine has improved my balance and joint pain. I feel stronger and more graceful when I move." Jennifer’s Pilates ball routine is both fun and challenging. As a former aerobics instructor, I appreciate Jennifer’s meticulous cueing, which insures that each student gets the maximum benefit from the exercises. I always look forward to her classes. She is fun and supportive making sure everyone comes away feeling stronger and more confident about how they are moving! In just over 30 minutes you will work all the muscle groups in the body from the inside out. Leave this page about exercise ball routines and find out more about my Pilates ball video and how it can benefit you.